If you enjoy my work and want to help me continue to make it, there are a ton of ways you can help to do so. There are of course the obvious ones - "Throw money at me!" - and there are numerous ways to do that, but that's not the only way! Below are all of the numerous ways you can help keep the DERP going, including things that are either cheap or totally FREE! FOLLOW ME ON SOCIAL MEDIA! - I am most active on Instagram and Twitter, but you can also follow me on Tumblr (it's primarily a duplicate of my Instagram feed though; still, if you prefer Tumblr to Instagram, it's there!) And while technically not social media, it'd be a good idea to follow me on Twitch and YouTube as well, so you know when streams go live or when I have a new video up. I am an unhip weirdo so I tend to be a late adopter for new Social Media platforms, but as I join new ones I will let you guys know! On the topic of social media, LIKE/COMMENT ON MY ART POSTS! - A lot of time and energy goes into creating art, and sometimes it can feel like shouting into a void if something you worked really hard on seems to go unnoticed. Because of that, your feedback is SUPER important to internet-based artists like myself. Did I try a new technique you're seriously digging? Is the subject matter something you'd like me to keep doing? Let me know! You don't even have to post a lengthy comment either; just a simple "this is neat!" is fine if you can't think of what to say. Even just hitting that +like or heart button is huge. Anyone who knows internet algorithms knows that this is both one of the most important ways to get noticed on any social-based internet site, AND one of the easiest. Smack that LIKE! SHARE MY WORK! - If I created something you enjoyed, there's a good chance you know others who would too. So not only are you helping me out by letting other people know about my work, but you're hopefully also brightening their day as well. If I did a commission for you, or you bought something from one of my shops, share it on social media! Don't forget to @ me when you do, especially on Twitter, so other folks know how to find me and my work if they wanna snag some stuff for themselves. HOW TO THROW MONEY AT ME! COMMISSIONS! Yes, I do commissions. My availability is fairly limited, as I have to juggle a full time job along side all of my creative stuff. However, if you have an idea and want me to bring it to life for you, feel free to email me at LizardbethArt@gmail.com for a quote. Serious Inquiries Only, Please! My On-Site shop is broken into two parts: One for ORIGINAL ART, unique pieces of art looking for a good home, and my SOUVENIR SHOP, which has numerous small & collectible items like stickers and pins. Everything from these two stores is handled, packaged and shipped directly by me to you. Each package will include a thank you note and sometimes a little surprise or two. I stream art & sometimes games on Twitch at least once a week. Twitch subscribers get the added bonus of exclusive emotes usable ANYWHERE on Twitch, and the ability to make art requests during occasional Sub-Appreciation Streams. *FREE TO WATCH! * Subscribing is 100% optional if you just want to hang out, watch, and chat. My Primary Print and POD (print-on-demand) product store. 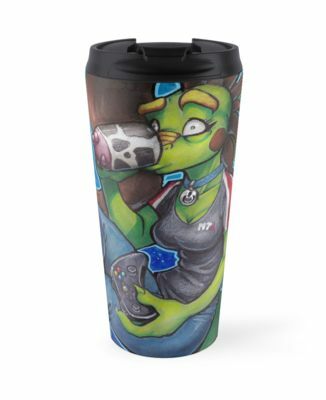 Any product I can't print myself (primarily for storage-of-stock reasons) you can get here, all of it featuring my art. New stuff pops in all the time! 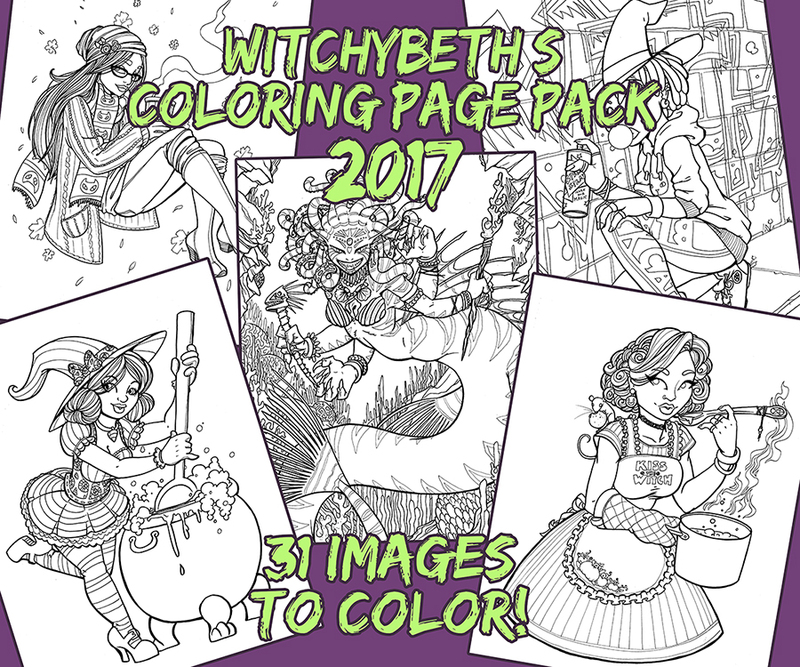 This shop features Pay-What-You-Want downloadable content, including (but not limited to) comics, sketchbooks, and coloring page packs. Everything in this shop has only a $1 minimum, so if you don't have a lot of money to spend it won't cost you much to get yourself something nice. A 100% optional monthly tip jar where you can opt-in to support or sponsor my art endeavors for whatever amount you want. My patrons get special bonus goodies from time to time, as well as priority to any commission spots I open up. A special Tip Jar where you can "buy me a coffee" with $3 increment tips. 100% optional, 1,000% appreciated!